There are nutritional deficiencies, and then there are nutritional imbalances. Nutritional imbalances can result from and imbalanced diet, or from carelessly formulated multivitamins providing ineffective or harmful forms, doses and ratios. Balance and diversity, comprehensiveness and potency: these have always been the guiding principles behind Ortho• Core, ones that culminated in the development of a truly complete and superior multivitamin. Ortho• Core provides all of the recognized vitamins and minerals in their most effective forms and doses available, topped off with the most powerful anti-aging phytonutrients and antioxidants known. Primary Uses: A balanced and well-designed multivitamin is fundamental to any supplement regimen. Unfortunately, factors such as market trends, one-capsule-a-days, equal quantities, high doses and the longest list of ingredients possible that are the basis for many multivitamins, may not end up benefiting the consumer's health. The problem is that to achieve these results, quality is often sacrificed, using poorly bioavailable or higher risk ingredients, or quantities that are inadequate, excessive or imbalanced. Ortho• Core is designed to correct all these common formulation problems while providing some of the most biologically active antioxidants and powerful phytonutrients available. 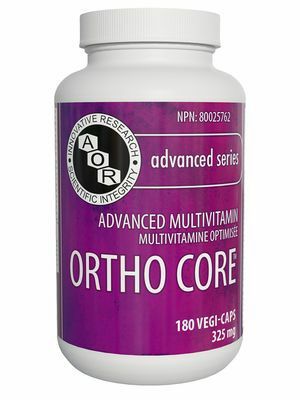 Anyone looking for a superior multivitamin or a single supplement for overall health will find that Ortho• Core is simply the most advanced multi available. Q: Why is the recommended dose for Ortho• Core 6 capsules a day while most multis require just 1 a day? A: In order to cram everything into just 1 capsule a day, most multis use cheap, poorly absorbable forms and tiny doses that won't do much for your health. Ortho• Core provides both effective forms and doses. In addition, Ortho• Core is more than just a multi: it's your one-stop-shop supplement to promote good health, complete with the most vital antioxidants and phytonutrients known including astaxanthin, lycopene, N-A-C, resveratrol, grape seed extract, green tea extract, R-lipoic acid, CoQ10 and more. CAUTION: Do not take if you are pregnant or breastfeeding. Consult a health care practitioner prior to use if you are taking blood thinners, blood pressure medication, antibiotics, nitroglycerin, or if you have diabetes, cystinuria, an iron deficiency or a liver disorder. Consult a health care practitioner if you develop symptoms of liver trouble or for use beyond 12 weeks. Contains soy.